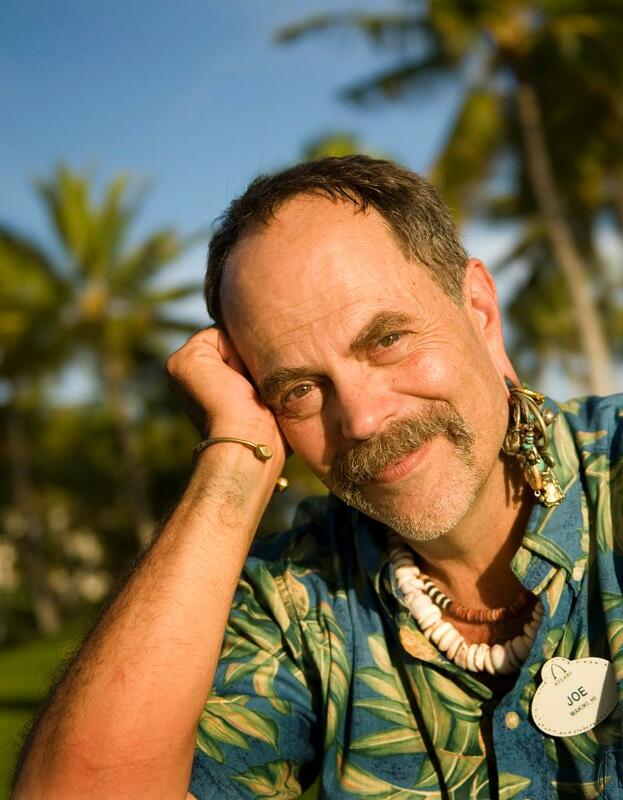 Joe Rohde is a 30-year veteran of The Walt Disney Company, starting his career as a model designer on Epcot, and continuing with projects for Disneyland Park in Anaheim, Calif.; Walt Disney World Resort in Orlando, Fla.; and Disneyland Paris. Joe led the team that conceptualized, designed and built Disney's Animal Kingdom at the Walt Disney World Resort. He continues to oversee new attractions for that park and is also responsible for the creative design and content of Aulani, A Disney Resort and Spa, at Ko Olina, O'ahu, Hawai'i, which debuted in August 2011. The challenge of creating Disney's Animal Kingdom, a park with a strong wildlife conservation message, involved years of research and negotiation with constituents from the scientific community, the world of zoos, and representatives of indigenous communities involved in the stories created in the park. In the process of developing the park itself, Joe was instrumental in the development of the Disney Worldwide Conservation Fund, which has supported more than 180 nonprofit organizations in 111 countries totaling nearly $18 million. Joe speaks regularly about design and narrative and has appeared at NASA, the Association of Zoos and Aquariums, the TED conference, Portland Creative conference, and has been the keynote speaker at SIGGRAPH in Boston and Yokohama, Japan, as well as many other venues. He is also a member of the Explorers Club. This nomination recognizes the complete reimagining of Star Tours, the first simulator experience installed in a themed environment. The original attraction had been in operation since 1987; new technologies were available that could enhance the experience. At the same time, the Star Wars mythology has remained ever relevant to succeeding generations of fans. The challenge was to remain true to the vivid stories while making use of new technical tools and guest interactive capabilities. The refreshed attraction has succeeded both operationally and with the extremely loyal Star Wars fan base. For the guests, the most compelling feature is the variable content that affords multiple storylines, locations and characters. This element of surprise is driving multi-generational audiences to return again and again to get a shot at exploring different vistas into many realms of the Star Wars Galaxy. Today's audience expectations for a high tech science-fantasy world as renowned as Star Wars far surpass the analogue entertainment world that existed back in1987 when Disney originated this granddaddy of simulators that became an industry template. 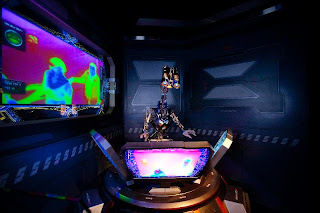 To achieve a breakthrough experience, all new "state of the art" 3D digital media systems were a given, but what really brings Star Tours-The Adventures Continueto life is a unique branching story structure employing multiple destinations and characters. This non-traditional storytelling device evokes curiosity by providing 54 potential show experiences resulting in a dramatic increase in attraction repeatability. To bring a layer of personalization and relevance, image capture systems are used to integrate riders into the varied story branches. All of this is fed into multiple motion programs designed for each random sequence, creating a multiplicity of kinetics for the 54 distinct profiles and unique real-time guest integrations. While the major components create the guest "wows", every nook and cranny along the pre-show queue likewise received new story elements and advanced special effects. This has extended the experience of this "galaxy far, far away" way beyond the doors of the Starspeeder 1000 and repositions the total experience firmly in a new century. 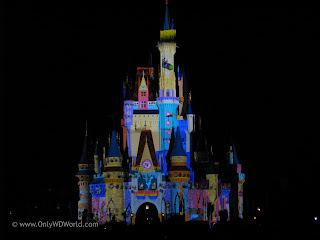 A new nightly show at Cinderella Castle in the Magic Kingdom, Florida. "The Magic, The Memories and You!" is a richly emotional and spectacular 10 minute show presentation. Using classic Disney icons and images, the show uses "mapped projection" to transform the castle into an ever-changing and magical canvas. In preparation for this nightly event, photographers have spent the day out in the park, capturing thousands of images of that day's guests having fun. Five hundred of these images are selected and incorporated into the show that night. The result? A show that is different at every performance and engages the audience in a unique way, and at a whole new level. This show demonstrates excellence for the artistic and creative way that technology was utilized to create a memorable and compelling experience. Impressive as the technology is, the show is ultimately successful because it uses that technology, along with visual creativity, adept directorial pacing and showmanship together with a stirring musical score in an innovative and compelling way to create a most memorable, unique and emotionally fulfilling experience for its audience. Animator's Palate on the Disney Fantasy brings the visual joy of Disney animation into the dining room with a new show called "Animation Magic." Guests are invited to draw a character of their own using a simple template on their placemat. After dinner, animated curtains are opened on screens and Sorcerer Mickey conjures guests' drawings - now fully animated and brought to life side-by-side with characters such as Mickey Mouse, Jiminy Cricket, Cinderella and Snow White in scenes from beloved Disney movies. At the conclusion of the show, Mickey returns to say "so long" to the guests and, as he does, credits roll onscreen showing each guest's name listed as a guest animator. Delightful image capturing and video magic have made it possible for a guest's sketch to come to life moments after being drawn. The amazing animation, from a simple face expression to a complicated dance step, is made possible in this ingenious use of technology. Everyone from Grandpa to a child can be an "Animator" and see their drawings come alive. A refreshing new take on "interactive" without the typical monitor screen. The TEA (Themed Entertainment Association) is an international nonprofit alliance founded in 1991 and based in Burbank, Calif. TEA represents some 7,000 creative specialists, from architects to designers, technical specialists to master planners, scenic fabricators to artists, and builders to feasibility analysts working in more than 650 firms in 30 US states and 40 different countries. TEA presents the annual Thea Awards and the TEA Summit and hosts the annual SATE Conference (Storytelling, Architecture, Technology, Experience). TEA also produces a variety of print and electronic publications, including the TEA/AECOM Theme Index, TEA Project Development Guidelines, TEA Annual & Directory and Thea Awards Program magazine. Like the TEA, the Thea Awards, sponsored by Economics at AECOM, were created to bring recognition to achievement, talent and personal excellence within the themed entertainment industry. From a modest beginning in 1994, the Thea Awards have become internationally recognized as a symbol of excellence. The public is welcome to attend the black-tie 18th Annual Thea Awards Gala, which will be held March 17, 2012 at the Disneyland Hotel, Disneyland Resort, Anaheim Calif. USA. Tickets may be ordered online at teaconnect.org. The name of the award is a play on three words: the first is "Thea," the Greek goddess from whom all light emanates. Thea was the mother of Helios (the sun), Eos (the dawn), and Selene (the moon). The second key word is "Theater," a word derived from the goddess Thea. The third word, of course, is TEA, the name of our association. 0 comments to "Disney Receives 4 Thea Awards From The Themed Entertainment Association (TEA)"